In my last article, I wrote about Age, Gender and Retirement Perspectives. 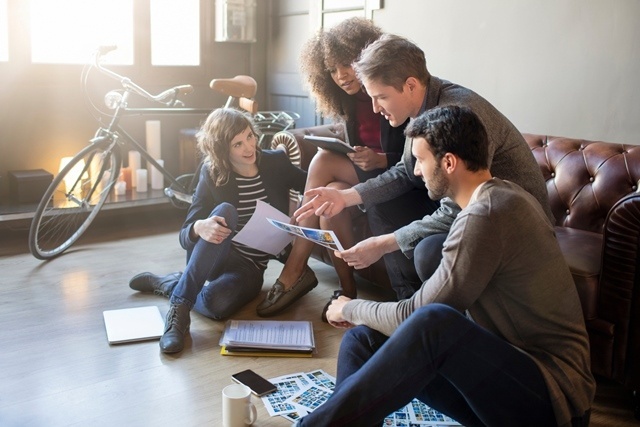 The opinion of retirees and older workers alike is that millennials may have a better chance to control their future when it comes to saving money for their future lifestyles. Let's take a closer look at that and consider the millennial perspective. 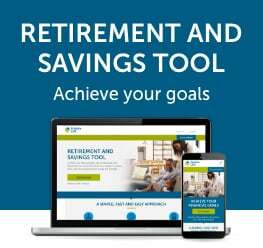 The Future of Retirement: Generations and Journeys research (2016) identified a number of approaches that people take when it comes to money and life which in turn affect their behaviours and attitudes to retirement planning. One approach was labelled; “assured optimists”. They represent about 16% of people surveyed and tend to be more optimistic about the future. They are more likely to have the luxury of being able to take risks while having fun and enjoying life. Millennial men may fit well into that category. They’re young, energetic and have time to accumulate money and recover from markets that have their inevitable downturns. They may enjoy spending money on vacations, toys and going out on the town. A natural focus is having a successful career. On the flip side, they are more likely to stop or face difficulties in saving and regret not seeking financial advice. Their battle, like so many working people, is satisfying the need for cash and gratification now while recognizing the need for cash to support lifestyles down the road. Current income and cash flow may matter more than the level of current investable assets. That in turn takes the focus away from the importance of future income supported by continual deposits into retirement savings plans. So Millennial men in particular, may at times be pulled in opposite directions. The same research found that while 6/10 consumers rank saving for retirement a top priority, there are gender differences. Women would benefit from investing time in discussions and activities that encourage them to make saving for retirement a priority. They could also benefit from getting involved in retirement planning exercises that boost their confidence when making financial decisions. The good news is that women are more likely to stick to a plan and focus on the end goal once they get started. 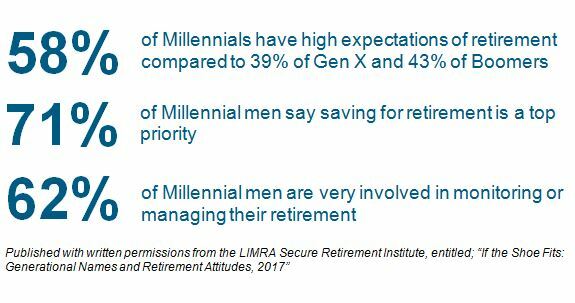 Not only do Millennial men have the highest expectations of retirement, they are confident in achieving them. They tend to be the most engaged with prioritizing retirement savings. They are also the most engaged in monitoring and managing those retirement investments. Does that sound like you? Millennial men may need better tools to gauge their actual level of retirement preparedness and avoid overconfidence, which can, in turn, undermine retirement security. Research consistently points out that people of all ages benefit from seeking professional advice when planning and saving for retirement. Ensure that professional advice comes from accredited advisors who subscribe to a Code of Ethics that can help to raise the bar when it comes to client/advisor relationships and turning those relationships into win-win scenarios on a long-term basis. After all, saving for retirement is a long-term proposition.